Have you ever been carried? (Talk about your own experiences or suggest times when a person might be carried.) A baby has to be carried because they can’t walk. A parent might carry a child to bed when they are sleepy. A fireman might carry a person out of a burning building when they save them. Think about what it would be like if you could never walk anywhere and someone would always have to carry you. In today’s story we are going to talk about a man who couldn’t walk. He didn’t have a wheelchair and someone always had to carry him. Peter and John were two of Jesus’ closest disciples. One day, when they were going to the temple to pray, they saw a man sitting right beside the gate (called “Beautiful Gate”). As they moved closer they noticed that the man was crippled. He could not walk. Now this was not the first time the crippled man sat there. His friends brought him to the temple every single day so he could ask people for money. Since he couldn't get a job or work, he was hoping the kind people who were going into the temple to worship God would see him and have compassion on him and give him money so he would be able to have food and other necessary things. The man saw Peter and John and as usual, he stretched out his hand to ask for money. "Please, do you have some money you could give me? I really, really need money." Well, our friends, Peter and John, looked at the man and told him, "Look at us!" The man looked up in eagerness, expecting to be given money. He had no idea what an unusual day THIS was going to be! Imagine his dismay when Peter and John said, "We don't have any money!" Imagine his surprise when they said, "We want to give you something better than money!" He thought about that. He was quite confused. After all, what could be BETTER than money? Then he heard Peter say something very strange. "In the Name of Jesus Christ of Nazareth, rise up and walk!" Should I try? Or should I ignore them and just sit here?" You can imagine all these thoughts flying through the man's mind in just a few seconds. Before he even knew what was happening, Peter reached down, took him by the right hand, and lifted him up. IMMEDIATELY his feet and anklebones received strength. He couldn't believe what was happening! His feet were actually HOLDING HIM UP! He JUMPED up, he STOOD up, and he WALKED around. He went into the temple for the first time in his life. This was SO exciting! He was WALKING and JUMPING for the first time in his life. He was PRAISING God because of the amazing thing that had just happened to him. All the people saw him WALKING and JUMPING and PRAISING God. They knew it was that crippled man who had sat outside the gate of the temple for many years begging for money. They recognized him and they were full of surprise and wondered what and how this had happened. The people started running toward Peter and John. They thought Peter and John had done a great miracle and they wanted them to do MORE miracles. Peter immediately started preaching to the crowd. "STOP! STOP!" he yelled. "Why are you so surprised about this? Why are you looking at us? WE did not perform this miracle. WE did not make this man able to walk! It is Jesus. The one whom you killed but was raised to life by God. This man was made strong by faith in the name of Jesus. It is Jesus’ name and the faith that comes through him that has completely healed him! Isn’t Jesus powerful? Because Peter and John believed in Jesus, His Holy Spirit was in them and they could do the great and mighty things Jesus did when He was on earth. 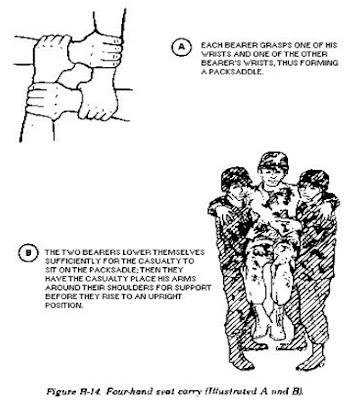 Using the four-hand seat carry, have the kids practice carrying each other across the room. Older kids can be divided into 2 teams to compete against each other.